Song:Are You Havin' Any Fun? These days Tony Bennett records so many duets, it's getting a little ridiculous. This record goes back to the late 50s when Bennett was supposedly the first "pop singer" to record with The Count Basie Orchestra. In 1957, Ralph Sharon became Bennett's musical director and he convinced Bennett that if he recorded more jazz, he would have a longer career. So he recorded the 1957 album The Beat Of My Heart with Al Cohn, Nat Adderley, Kai Winding, Herbie Mann, Milt Hinton, Art Blakey and Chico Hamilton. So then he wanted to work with Count Basie. At the time, Basie was at a high point with albums like Atomic Basie. The only problem was Basie was recording for Roulette and Bennett was recording for Columbia. A deal was worked out where they would record two albums. One would be released on Roulette and the other would be released on Columbia. Are You Havin' Any Fun? is from the 1959 album commonly known as Basie Swings, Bennett Sings on Roulette. This album was also released as Strike Up The Band. Sharon wrote the arrangements and Basie's band included Al Grey's trombone solo, Thad Jones, Snooky Young, Frank Wess, Frank Foster and Freddie Green. The second album In Person! was released on Columbia. It was recorded live at the Latin Casino in Philadelphia in mono. But producer Al Ham wanted it in stereo. So he recreated the concert in the studio and then added fake applause. Everyone hated that and when the album was released on CD, the applause was removed. Both albums are short so fortunately Jasmine Records has released both albums on one CD. Bennett has since recorded Are You Havin' Any Fun? with Spanish singer Dani Martin and then Elvis Costello. I think you're better off with the Basie version. Here's a video for Are You Havin' Any Fun? 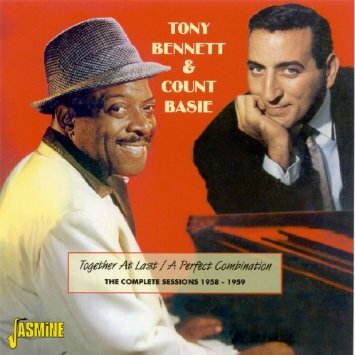 by Tony Bennett & Count Basie.